The debate over the pros and cons of electronic health records (EHR) is largely academic. EHRs are here to stay. It is inevitable that medical record-keeping will continue to move toward a future that is all-digital. Although data breaches have been numerous and widely reported, the benefits of EHRs for physicians, hospitals and patients are undeniable. The passage of HITECH in 2009 federally mandated that the nation's health system adopt electronic record keeping. In 2012, a three-phase incentive program was instituted to speed the process of physicians making the switch to electronic health records. About 3/4 of physicians indicate that remote access to EHRs has improved patient care and added to efficiencies. The cross-referencing of patient data by physicians has also been a boon to medical treatment. Some patients with multiple afflictions were treated in more disjointed ways in the pre-EHR days when various specialists could not get a comprehensive understanding of a patient's various conditions, prescriptions and treatment protocols. In a 2011 study of physician work flow, 41 percent of doctors said that EHRs had helped them to avoid medication errors in the previous 30 days. Meanwhile, fully 74 percent had benefited from the ability to remotely access a patient record. Half of the physicians in the study reported that they had been alerted to a critical lab value thanks to EHRs. Finally, one-fourth of the doctors said that EHRs had been responsible for enhancing communication with patients. Of course, data stolen either by hackers or insiders presents an expensive challenge. Consider the case of a data breach at Howard University. Over a period of almost a year-and-a-half, a medical technician allegedly stole patient data, including names, addresses and Medicare numbers. She then allegedly sold some or all of this information on the black market. On May 14, 2012, federal prosecutors proceeded to charge the medical technician with HIPAA violations. Also in 2012, overseas hackers broke into a server at the Utah Department of Health and accessed the private medical records of an estimated 800,000 citizens, about 25 percent of the population of the entire state. The largest data breach thus far is believed to have involved a company called TriCare Virginia, which is involved in military health insurance. Back up tapes had been stolen from one of its sub-contractors on Sept. 13, 2011. These tapes were believed to have contained records for about 4.9 million Americans. Names, addresses and social security numbers for many of the patients were believed to have been on the tapes. Some lab test results and even clinical notes were believed to have also been on the back up tapes. More recently, cloud-based record-keeping has lessened the threat of the theft of physical back up materials. Enterprises operating the servers and back up servers that store EHRs in the cloud operate under strict mandates involving everything from the security of their physical facilities to comprehensive digital security as well. Also, health care providers have been moving toward more sophisticated encryption techniques, methods that the financial industry had already employed for some time before they were more widely adopted by the health care industry. The Department of Health and Human Services has been involved in levying multi-million dollar penalties when the privacy of EHRs has been compromised, and this has likely had an impact on providers speeding the adoption of better privacy safeguards. Electronic health records are not a fad. They are here to stay and are available now. Although there are security concerns, improvement in privacy safeguards are being deployed. 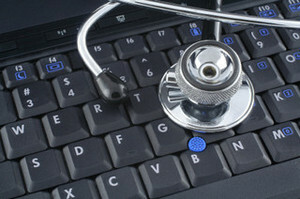 The benefits of EHR in healthcare outweigh potential concerns. Derek is blogging for Nuvodia, an integrated health care solution company that specializes in HL7 integration, radiology informatics, and outsourcing health IT services. He enjoys blogging about different health trends and new technology in the medical field.